More Fluff and More Soap Suds!! 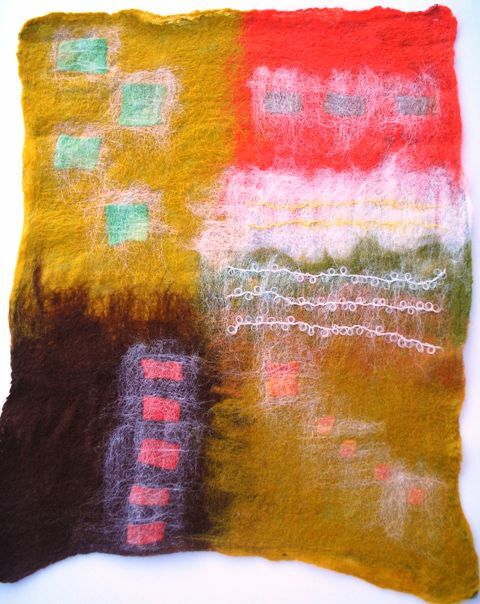 Last Friday I learnt a lovely new wet felting technique – Nuno Felting. It involves a similar process to the one used to make a flower brooch back in June but this time we felted onto a piece of fabric. Muslin was recommended by our tutor, Mo Jackson, as this has a loose weave and enables all the little wool fibres to knit into it as the wool is felted. The result for me was a wall hanging – well it’s not a wall hanging yet, but it soon will be! We had ten people at the workshop and all of us mastered and created a unique piece of work. One lady made a very pretty scarf by leaving some of the muslin uncovered, others left small gaps so that light could show through if the hanging was put in a window. Some people used muted, soft colours; others went wild with vibrant pinks and greens – all the results were stunning in their very different ways. We had the option to add yarns, pre-felted material and sparkly bits to our creations. These would not felt unless we covered them with a fine layer of wool to hold them in place during the felting process. Some ladies went to town with this but I decided against bling on this occasion. I tried to make my piece not too fussy with angular blocks of colour rather than random wisps. I had my new lounge colour scheme in mind as well. You can see the result below. Now all it needs is some little loops of ribbon or fabric, a little cane to thread through them and serve as the top and someone with a hammer to put a nail in the wall! !